Over the last few years, the AZMGA has been working with researchers at the University of Arizona Pryor Lab to conduct trials to determine optimal conditions that maximize production. These trials examined all facets of the production process—from spawning to substrates and fruiting environment conditions. We'd like to share the results of this research with our members. You'll find below data gleaned from these trials with short interpretations about the data. One of the metrics used to determine efficacy of production in these studies is bioefficiency. For an explanation of bioefficiency, please see our presentation slides. Also, feel free to contact us with any questions about this research or for elucidation of the results. Producing reliable spawn is critical in ensuring the broader success of a cultivation operation. As with all stages of production, substrates and environmental factors influence the success of spawn colonization. Spawn is generally grown on a substrate of grain seeds. As with any substrate, the efficiency of colonization on a particular substrate varies from species to species. This trial shows that cracked corn facilitates the shortest colonization period. 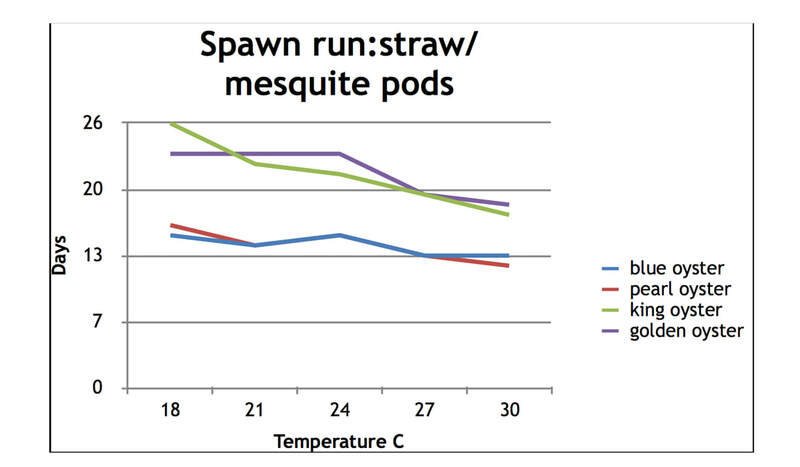 The temperature in the environment where the spawn is stored also effects how quickly the spawn is fully colonized. Across the cast of species, the trend is the same: 30° C (about 86° F) is an optimal temperature for the development of spawn. Once the spawn has been fully colonized, it can be used to inoculate bulk substrate. The Pryor Lab has been working with substrates that are locally available in Southern Arizona and determining which species are best suited to particular substrate mixtures and ratios. The charts below show the findings. The first substrate trial examined optimal ratios of carbon source to nitrogen source for a single mixture; in this case straw (carbon) and mesquite bean (nitrogen) mixture. A ratio of 70:30 carbon:nitrogen was found to be the most effective producer. In this trial, the carbon component of the substrate was changed while keeping the nitrogen component—in this case cottonseed— consistent. The standard ration of 70% carbon and 30% nitrogen was used. 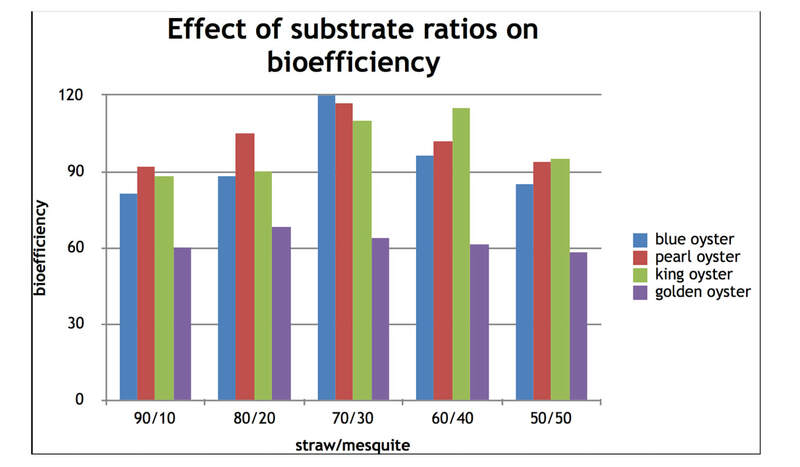 Interestingly, sorghum stalks expressed the highest bioefficiency in all species tested. (70% / 30%). For all species, with the exception of golden oyster, cottonseed was the most effective. The spawn run is the period during which the spawn colonizes the substrate. Similarly to efficiently producing spawn, the speed at which the mycelium grows during the spawn run is influenced by environmental factors. 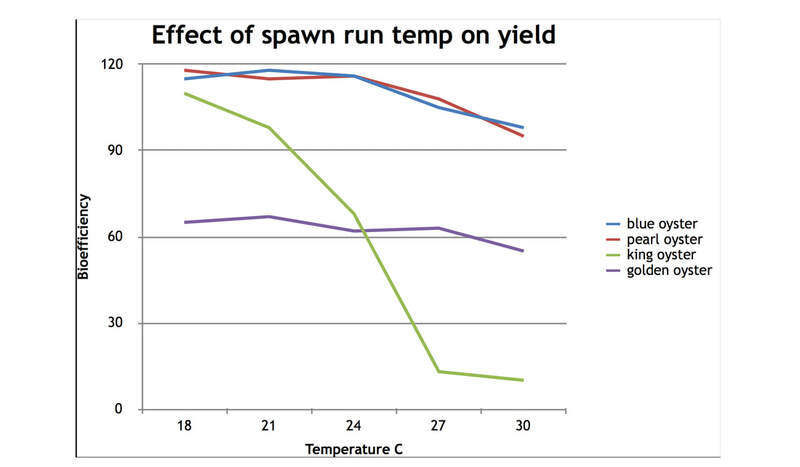 The Pryor Lab examined the effect that temperature during the spawn run has on efficient colonization and on yield. The first trial examined how temperature effects the length of time taken for the mycelium of various species to colonize substrate composed of straw and cottonseed. Consistently, around 30° C (86° F) was shown to be an optimal temperature for efficient growth, requiring only 13 days for blue and pearl oysters to finish their spawn run. Next the same trial was run but focused on a straw/mesquite pod substrate mixture. 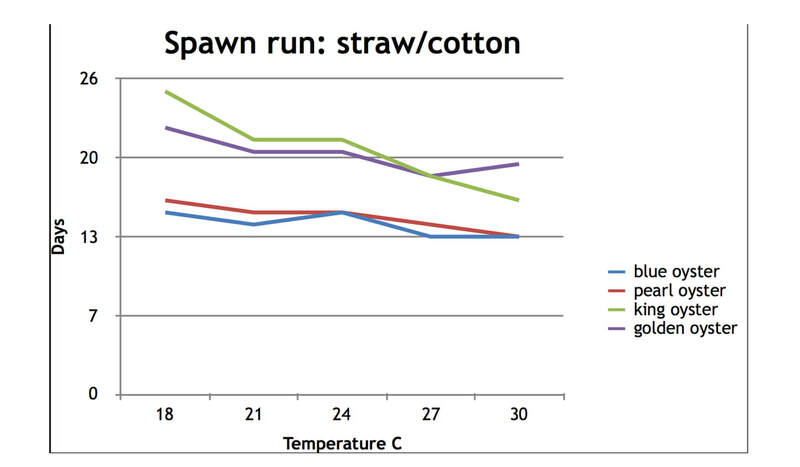 The results were effectively the same as the straw/cottonseed trial: 30° C is an optimal temperature for rapid spawning. These trials, combined with the data from the corn spawn trials indicate that mycelium grows quickest at warmer temperatures, regardless of the substrate that it is growing on. However, a final test showed how a short spawn run can effect yield. When subjected to higher spawning temperatures—temperatures that the preceding tests showed facilitates quicker colonization—yields suffer. Allowing the mycelium a longer spawning period at lower temperatures produces a better yield. This effect is seen most dramatically in the yields of the king oyster species—when temperatures reach past 18° C bioeffeciency drops dramatically with each degree that the temperature climbs, with growth almost entirely terminating beyond a spawning temperature of 27° C.
The final stage in mushroom cultivation is the production flush. During this stage the mycelium produces its fruiting bodies—mushrooms. Environmental factors are critical at this stage: carbon dioxide content, temperature, and humidity. The Pryor Lab examined in detail how temperature effects yield. 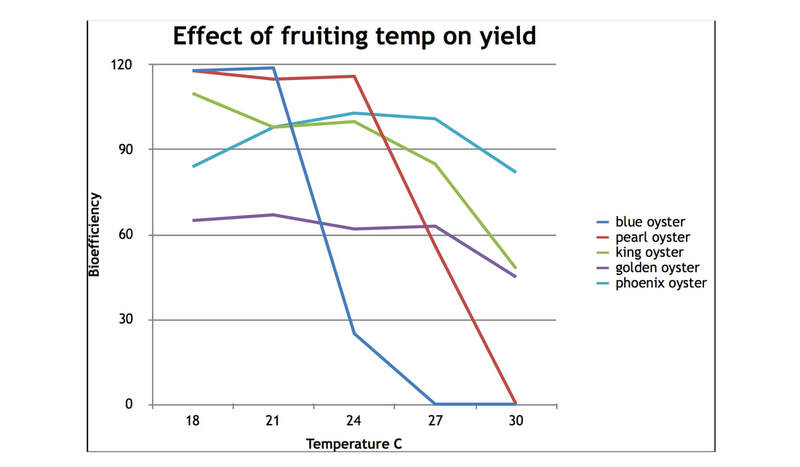 As the results show, optimal temperature during the fruiting stage is around 23° C for most species. The truly interesting outcome of this study, however, was showing how quickly and dramatically yield is effected once a certain temperature threshold is reached and surpassed. The most dramatic example can be seen with the blue oyster species. 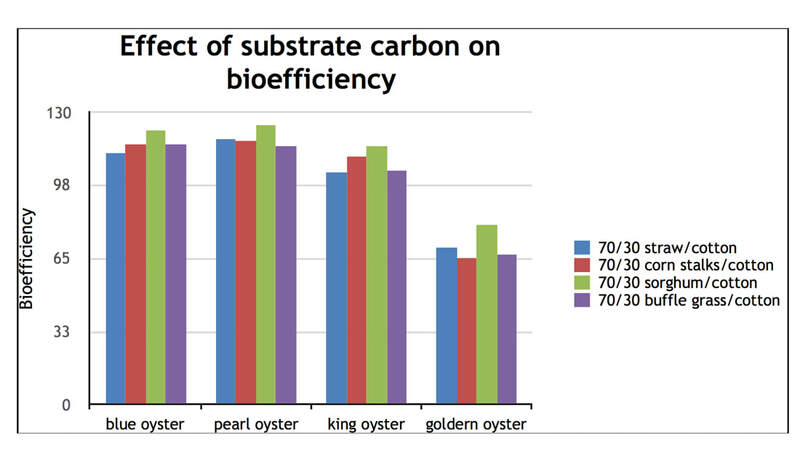 At just over 21° C, bioeffeciency drops precipitously from nearly 120% to complete termination at 27° C. The pearl oyster species also shows a similarly dramatic drop. We hope this research will be of use in helping your grow operations run more efficiently. The AZMGA and our University partners will share more research here as it become available.